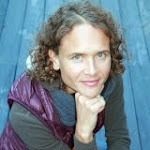 Last night was my fifth session with the Squamish Titans' masters swim squad led by coach Roseline Mondor Grimm. We began with an easy 300-metre warmup, using whatever stroke we wanted. I opted for a mix of freestyle, breast stroke and backstroke. Next up were four sets of the following: 50m regular swim, then 50 sprinting (freestyle) as hard as possible, following by 50 of gliding, i.e. swimming with relaxed long strokes. We had 20 seconds of rest between each 50. Then there was the core set; the two fastest lanes had three sets of 400m -- the first was a timed 400 freestyle, followed by a minute rest, then a 400 freestyle with pullbuoy, another minute rest, and a 400 with fins. The 'slowest' two lanes, which include me, only had to do the 400 pullbuoy and 400 fins. I love swimming with a pullbuoy, and fins make it completely effortless. In our 25m pool, we had to count eight 50s of course, which can get a little more confusing than you'd think. It was a nice set. As I was getting ready for the final 200 cooldown, Coach Roseline suggested I try a timed 400 freestyle as well. Erm, OK.
Thirty seconds later I was off on my first unassisted 400-metre swim in, well, forever. I focused on two things: keeping track of the laps and breathing as calmly as possible. I pushed myself and soon enough very much enjoyed the challenge. Having struggled with a running injury since late June, I have missed the pleasure and satisfaction that hard endurance efforts against the clock bring. I had no idea of what lap times I was swimming; I can tell you my kilometre and mile pace for every race distance as a runner, but any references in the water are only held in my mind by half Ironman and full Ironman swim split times from races done in 2005 and earlier. The final two 50s I tried to push a little harder; I could hear Coach Roseline yell encouragement each time I pushed off the side of the pool where she was timing me. The result was 7:31. Partly because I was tired from the effort, and partly because I don't recall doing any timed 400s before, I said I had no idea what that meant, as in, I had no reference point. She said it was good because it meant I had kept it under 8 minutes, and the simple math of sub-60-second 50s occurred to me. In a way it was harder to do the timed 400 after the other two (and the previous 750m) because I was a little tired and because I had just experienced the extra buoyancy and power of using the pullbuoy in one set and fins in the next, neither of which I could use in the timed set of course. But it was also mentally easier because I had just felt how long it took to count eight 50s twice before, and by starting a little fatigued I had less energy to begin too fast. I'm glad Coach Roseline encouraged me to do it. It's great to have a benchmark 400 time to work with, and aim at improving it over the next few months. I also came across this neat comparison between 400m swim- and 1-mile run times on Let'sRun.com. My best timed one-mile run is 5:42 (set in mid-2012), compared with 7:31 for my 400m swim, of course set yesterday. I look forward to narrowing the difference -- hopefully not just by having slowed down in my running in the layoff because of injury :-). Tim has swum a sub-6-minute 400m (set in mid-2012 in, of all things, an 800m time trial where he covered the first 400 in 5:54 and the second in 5:59), while his fastest timed one-mile run is a 6:06, also done in mid-2012. How do your 400m swim and 1-mile run times stack up? Worth testing, just for fun, if you haven't already. 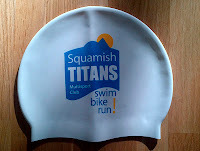 And, fittingly given the timed effort, Coach Roseline last night handed all new squad members including me the Squamish Titans swim cap. 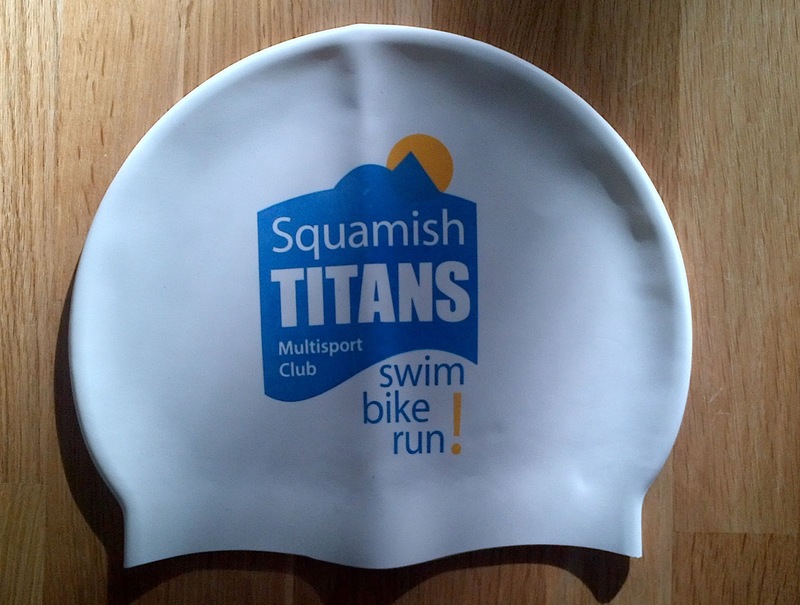 You can find more info on the Squamish Titans here; the running program begins next Tuesday, details coming soon.